Global energy leaders gathered for the 34th IHS Energy CERAWeek to discuss innovation and unconventional gas against a down cycle backdrop that the conference characterized as the “new normal.” Saudi Aramco’s Muhammad M. Al Saggaf, acting service line head of Operations and Business Services, emphasized that “innovation is not an option; it’s a requirement for success and survival of an organization” at the conference’s opening plenary session, “Sustaining Innovation through the Cycle.” Al Saggaf agreed with fellow panelists Steve Bolze, president and CEO of GE Power & Water, and Shaikh Nawaf Al-Sabah, CEO of Kuwait Foreign Petroleum Exploration Company (KUFPEC), that maintaining investment and long-term purpose are critical. He identified five characteristics necessary to be innovative during challenging market economics: tenacity, boldness, collaboration, diversity, and vitality. “You have to have big dreams,” said Al Saggaf. “If your dreams are mediocre, then they’re not worth pursuing.” He said that collaboration tends to suffer in down cycles because it can be easily cut; however, he emphasized the importance of maintaining collaborative efforts to stay credible, continue building bridges, and create future opportunities. Innovation at the heart of R&D Saudi Aramco has illustrated its unwavering commitment in support of innovation, which figures prominently into its global research and development program. Al Saggaf specifically pointed to three new research and development (R&D) centers in the United States — Boston, Detroit, and Houston — which makes a total of nine satellite centers, as well as the established R&D centers in Dhahran, for which the company has increased funding for. Chosen for their strategic locations for nanotechnology and new energy initiatives, fuels and engine research, and upstream exploration and production hubs, the centers further leverage the company’s long-term commitment to solving today and tomorrow’s energy challenges. Innovative R&D is contributing to the company’s strategic goal of becoming one of the world’s leading creators of energy technologies by 2020. Unconventional gas development: the North America model During the strategic dialog “A New Model for Unconventional Gas,” Ibraheem Assa’adan, Saudi Aramco’s vice president of Exploration — along with Ahmed Hashmi, global head of Upstream Technology at BP, and Jianzhong Li, director of the China National Petroleum Corporation (CNPC) — explored the application of the unconventional gas development model outside of North America. Unconventional oil and gas plays first became commercially viable in North America, creating a knowledge base there. The story of successful unconventional gas development is underpinned by small, fast-acting exploration and production operators who are familiar with narrow margins and economic modeling and business practices that do not fit conventional petroleum planning. “Can we just copy and paste the North America success model?” asked Assa’adan during his presentation. To answer, he looked at the similarities and differences between the two unconventional gas drilling environments, pointing to the Kingdom’s growing need for energy to fuel power generation. Unlike the United States, the drives and triggers come from a macroeconomic perspective rather than a single operator focused on specific plays and cash flow. In describing Saudi Aramco’s approach, Assa’adan explained that the organization is taking best practices, where applicable, and customizing the model for maximum efficiency and effectiveness. The quest for unconventional gas is being supported by a dedicated business formed within Saudi Aramco to match the unique characteristics of unconventional exploration and production. When asked about expectations for the scale of activity for unconventionals within Saudi Arabia, he emphasized that activities were driven by demand. Assa’adan noted that the focus on unconventionals has the company looking at modular processing facilities, fit-for-purpose rigs, water management and recycling programs, as well as leveraging some of North America’s best practices. 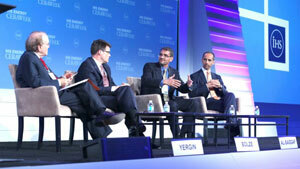 Saudi Aramco and CERAWeek Saudi Aramco was one of the strategic partners for the energy event. CERAWeek is considered one of the world’s most influential annual gatherings of industry leaders, with more than 300 executives, government officials and thought leaders from companies such as GE, Statoil, Total SA, Repsol, BP, ExxonMobil, Shell, and others from around the world attending. More than 100 sessions addressed a variety of topics, including technology, geopolitics, refining, pricing, liquefied natural gas, and geographic focus on regions of the world such as Africa, the Middle East, China, India, Russia, and the United States.